This is the fifth part in a series of interviews about “Where We Are Going” with Michael F. Shaughnessy of Eastern New Mexico University. School reform has now been a topic for generations but there seems to be little improvement. Any suggestions? Any meaningful reform must affect the student-teacher relationship. I cannot think of a single school reform that started top down (and was a headline twenty years ago) that is still being used today. This is the fourth part in a series of interviews about “Where We Are Going” with Michael F. Shaughnessy of Eastern New Mexico University. What kind of assistance is found at your website? MarvinMarshall.com is the foundational site that contains free information explaining the entire system. This site includes such links as The Discipline Without Stress® Teaching Model, The Hierarchy of Social Development, support links, and other links to implement the proactive, totally noncoercive (but not permissive) system . My aim is to have teachers increase their joy of teaching, reduce stress, improve relationships, and become more effective. This is the third part in a series of interviews about “Where We Are Going” with Michael F. Shaughnessy of Eastern New Mexico University. 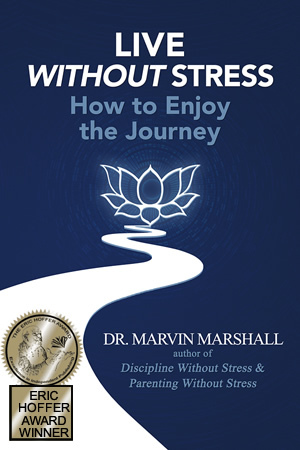 Your book “Discipline without Stress” has been out there for several years. Any idea as to how many schools use and refer to it? Since the book was published in 2001, 50,000 copies have been sold so far. The next 10,000 copies will be off the press within the next few weeks. I’ve heard it said that the book is perhaps the best ever published on how to discipline and promote learning. This is the second part in a series of interviews about “Where We Are Going” with Michael F. Shaughnessy of Eastern New Mexico University. I have enjoyed your Oliver Wendell Holmes story about the issue as to where we are going. With all this emphasis on Annual Yearly Progress and the re-authorization of No Child Left Behind (NCLB) , where indeed are we heading? Can you tell us the story to set the context for this interview? Your books and teaching model are used quite extensively in schools nowadays. To what do you attribute this? The Discipline Without Stress approach uses common sense. It is a total system. It is both simple and comprehensive, employing universal principles that apply to people of all ages. It promotes both responsible behavior and a desire to WANT to put forth effort to learn. Finally, it improves relationships and increases effectiveness.